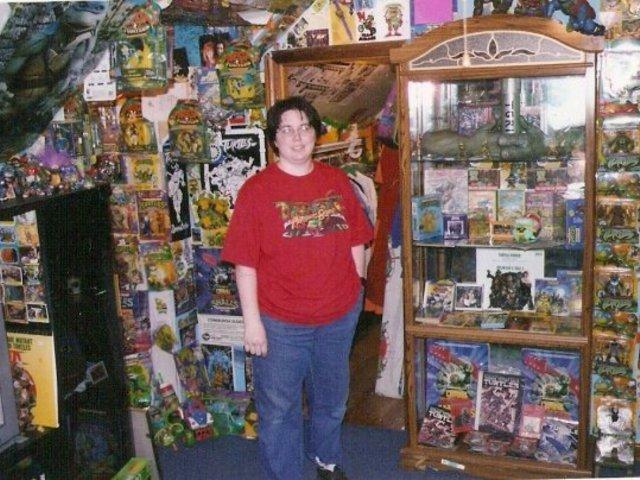 Is Michele Ivey The World's Biggest Ninja Turtles Fan? 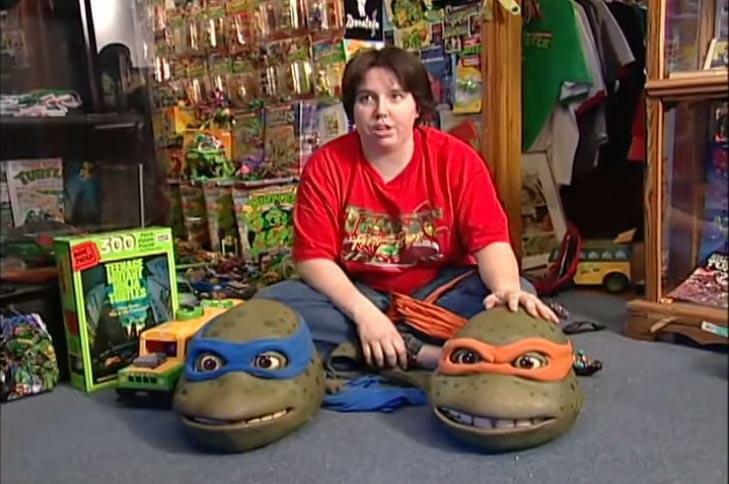 Is Michele Ivey The World’s Biggest Ninja Turtles Fan? 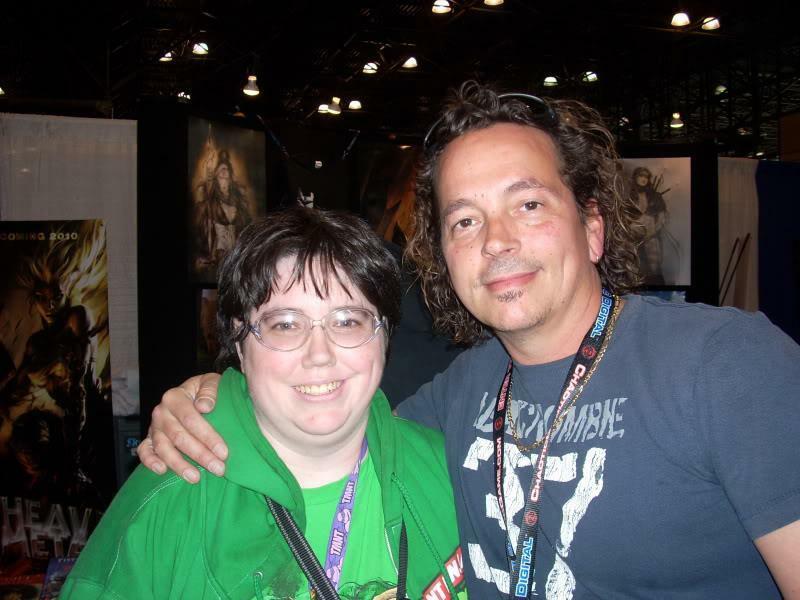 We recently had the opportunity to catch up with Michele Ivey and discuss her love for the Teenage Mutant Ninja Turtles and the truth behind her obsession. Let’s start by clearing the air. Everyone knows you from the Ripley’s Believe It or Not! Curioddities and the Totally Obsessed show on VH1. Is there any truth to it? Do you actually believe you are the fifth Ninja Turtle? There’s no truth to either of those stories. VH1 spent three days at my house saying it was going to be a serious story, though when it came down to things they edited it to be something [of] their own. I have never seen myself as a real Turtle. 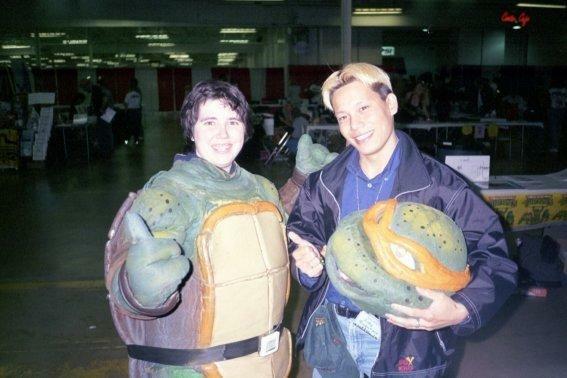 At most I would love to be the person wearing the costumes for TMNT movies, shows or events. It’s fun and brings the character to life for children. For behind the scenes of VH1 show watch episode 40 of Cowabunga Corner, where we followed the crew around with our own camera. Would you describe your fixation with the Ninja Turtles as obsessive? Oh yeah, I know I’m obsessed. But I don’t let it take over my life. My family, friends, pets and bills all come before my fandom. Ninja Turtles are a big part of my life and have been for over 20 years. I don’t see it going away. Though I also do not see it hurting me or anyone I know. What is it about the Turtles specifically that interests you and cultivates your passion for collecting? The Teenage Mutant Ninja Turtles are heroes that know how to defend themselves, without fancy powers or lots of money for big toys. I was a kid that went through a lot of pain in school, ganged up on by groups of 15 to 30 kids, throwing me in front of cars, pushing me into polls and more. All of the other heroes had unrealistic ways to defend themselves. The Turtles were the first hero that taught me I could stand up for myself. They also inspired me to read and got me hundreds of friends around the World, making a big change in my life for the best. The collection started off as a normal kid collection with toys, colouring books and comics. I started getting original art and props later. When I came up with the idea of doing a Museum, which is my dream for this collection, I started to collect a little bit of everything, including the small stuff I wouldn’t buy before. [It is] just [so that I can] share it all, if a museum ever happens. In your vast collection of Turtles memorabilia, what stands out to you as your most prized possession? My homemade Turtle costume. My dad, mom and I made it. 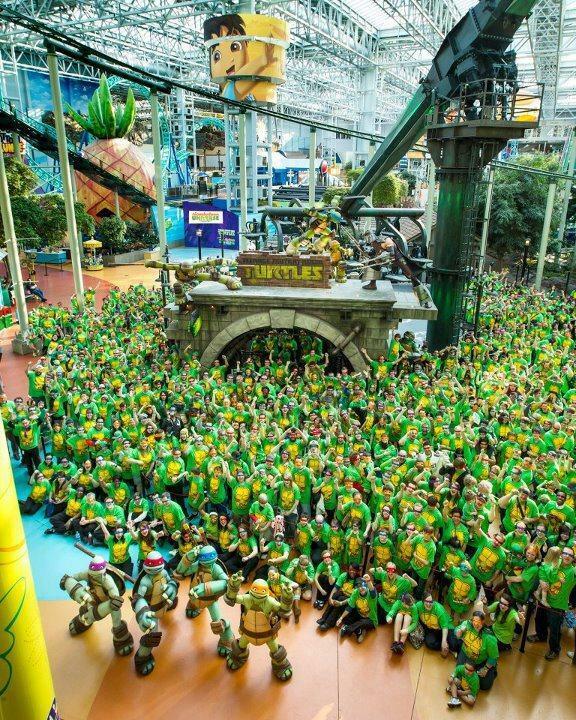 I have worked over 150 birthday parties as a Turtle, as well as movie theatres, parades and free visits to hospitals for sick and injured children. This piece in my collection has given me so many wonderful memories and have brought happiness to others. While it is retired now and I’ll like to make a new one, I’ll never get rid of it. I imagine that there are some privileges to be named “The World’s Biggest Ninja Turtles Fan”. Could you name some of them? Privileges? People may think that, but I see everyone as equal in the fandom. And everything that I’ve done as a fan, I’ve worked for [and] I’ve pushed for. And there’s nothing that I’ve done now, that happened because of VH1 show. 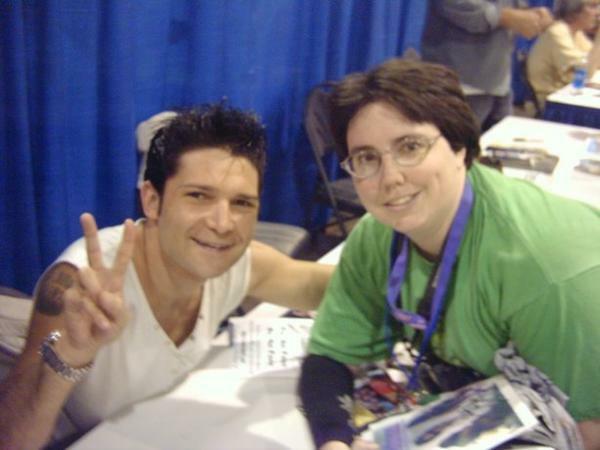 Before I was on TV I was visiting the studios, getting backstage at the concerts, making friends with the amazing people behind Ninja Turtles and holding events to meet up with fellow TMNT fans. These are the things I still do today. None of it from a title, everything is me pushing myself to the limits to get to these places, meet these people, and see TMNT history in the making. I firmly believe that any fan that wants to do it, can do what I have achieved. Which is why I share my stories, so people know how I’ve done it and what they could do if they really wanted too. What is your ultimate dream/fantasy/experience as a Ninja Turtle fan? What would be the cherry on the top? Dream/Fantasy – A full-time job working on Teenage Mutant Ninja Turtles. [I] don’t care if it’s wearing costumes, doing art, writing, voices, or anything that will keep me employed. Though I know a lot of fans with that dream, it is what I’ve been trying to achieve for two decades. Experience, that would have to be when I visited the set of the Next Mutation – walking through the Subway lair only to realize it was the same one used in the second and third movie. Seeing the filming and costumes in action while there. Getting to read the scripts. Watching the stunt doubles go through moves over and over again. These are things that, seeing in person, really brings to life how much work these folks did to produce a TV show for us fans. It even got me more driven to try and work for the studios. I would love to be a part of something so driven to bring entertainment to those who want to see it. You run a popular Turtles fansite called Cowabunga Corner. Tell us how that came about and how it’s doing? I started Cowabunga Corner in early 2010 because so many were interviewing me, cutting up the stories and leaving out some of the important parts to make me look different. They wanted ratings, not the truth. My goal with Cowabunga Corner is to get my true stories out, show people how I’ve done what I’ve done and that I’m not alone. Sharing the heart of a fandom in interviews with the people who helped create and bring the characters to life for entertainment and the people who have kept it alive by enjoying this entertainment. Cowabunga Corner is a website about a thriving fandom sharing our passion, fears, and life. With reviews, interviews and events. The website is going over better than I could have thought. With stories posted three to five days a week. We have a lot of viewers who work on TMNT, as well as fellow TMNT fans. 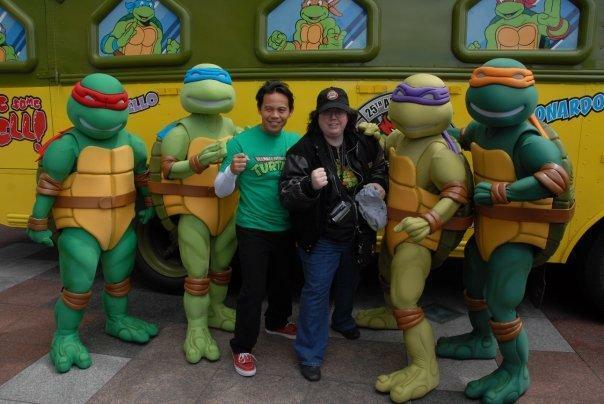 Some of our viewers are not TMNT fans, but fans of other media that understand the passion behind Cowabunga Corner so they enjoy what we do there. It’s not really a site about Ninja Turtles as much as it’s a site about keeping the spirit of fandom alive. So we do more than TMNT reviews on there, from movie to comic reviews. The most important thing about fandom is realizing everyone has one. Be it comics, cartoons, coins, music, work, girls, sports, cooking, boating, fishing, and so much more. You look around at everyone and you can find that each person has a passion, if they want to publiclyit public or hide it away. For me, Ninja Turtles is my passion and I’m proud to share it. That just makes me a loud fan, one of many. So Michael Bay’s new Turtles film is releasing in August. What are your expectations and how do you feel about the changes he has made to the characters? Do you mind the fact that they now have noses? Not the first time they’ve had noses… True, it’s the first time they got real lips… not sure how I feel about the Turtles looking like Shrek. But looks alone will not get me to judge this movie. I want to see the plot and characters more, so will be seeing the movie as soon as it comes out. I did not like the looks in the 3rd movie, still love the 3rd movie. In fact I like the looks of the 3rd movie more than this new look. I am not a fan of the looks of the Turtles in the Coming Out of Their Shells Tour, but I am a huge fan of the tour itself. Looks is only one part of a show. Am I scared of the new movie? Of course. Like most fans I’m watching the trailer and wondering just how much they’re going to change it. Sometimes change works for a series like with the IDW Comics for TMNT, these comics are different than any other media out there with their stories. But they’re done right, fun to read and the characters are still very true to who they are. Though sometimes change can be done wrong, example: “The Last Air Bender” Movie. Most fans of the cartoon will not stand by this movie. And that’s where the fear comes from. Change is good… but can go too far. Is the new movie pushing that line? We will have to wait and see. Do you have any interests outside of The Ninja Turtles? Of course. I love travelling, I love my family, I love animals, I’m into anime, and 60’s music. My favourite band is the Monkees. My favourite TV series on air right now is Supernatural. Most of my local friends are not TMNT fans, so we don’t always do TMNT stuff together. While the Turtles are a big part of my life, they don’t control my life. Hypothetically, in an alternative universe where it would be possible, if you were a Ninja Turtle, how would you imagine yourself? I would not want to be a real Ninja Turtle… even in another universe. If I was… I’d be like Mikey wanting to be human to make friends. I would rather be a human that could meet the Turtles if they were real. Though I am thankful that they’re not real… humans are very mean to the things that we don’t understand… if the Turtles were real… could you picture having to live in hiding and truly never just relax to enjoy life out in the open? I’m already different enough to be picked on by my own race… I’m not one for the shadows, and I would never wish that upon anyone. One day, I’ll prolly have a Batman collection like this, so right-on, right-on… Also, one day, I shall kill Batman and take his place… [heavy breathing]. Ivey is a good woman. I respect her and I believe she is trustworthy. She is very entertaining if you take the time to track down her archives. I AM a TMNT fan and I am a fan of her and Cowabunga Corner. I respect Ivey and her crew (Emer, Phoenix, Star, Fugitoid, tOkka, Leatherhead, Sevenangelo, Miki, Klork, Horse Turtle, TheShredder, Kameko, mica, buslady, Voice Chasers, fae, TurtleNinja, Shadow Wolf, Crittle… etc they are all known about) for working as hard as they do. I’ve only got two things about this interview and one on being privileged. Yes Ivey does come from a humble background but her dad is a well known artist. Yes she did have some rough times. But I do think that she has been more privileged than she’s letting on. You’ll find out in her book down the line. Miki Ivey is well known to The Monkees. There’s more to this story… like I said wait for the book sometime after her store is open. I believe Ivey is the Stephen Sansweet of TMNT and will be hired even as an ambassador eventually (if she isn’t already). Lastly about TMNT V… there’s nothing to be afraid of. At best it will raise awareness of TMNT and at worst it will be a forgettable passage just like the Transformers movies were. I prayed and will continue to pray for Michele to have safe travels because I care about her. She’s exalted in my book, I don’t think higher of anyone other than my family. I would cry tears if anything happened to her. She deserves it. Have a nice day.